Why? 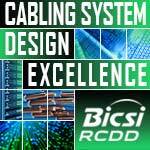 A BICSI Registered Communications Distribution Designer (RCDD®) understands ALL aspects of cabling infrastructure design. From initial planning through project completion, an RCDD can communicate smart design to any person on the team (even the client) and then execute it within project parameters. Infinite Convergence Solutions, Inc., a carrier-grade next-generation mobility solutions provider, has added 4 key additions to its Enterprise Messaging Service (EMS) -- Two-Factor Authentication, One Time Passcode, Text-to-Speech and a new Content Management System (CMS). These new services are powered by Infinite Convergence's industry-leading, carrier-grade technology and allow enterprises to better engage their customers and partners globally using a secure, reliable and feature-rich messaging platform.